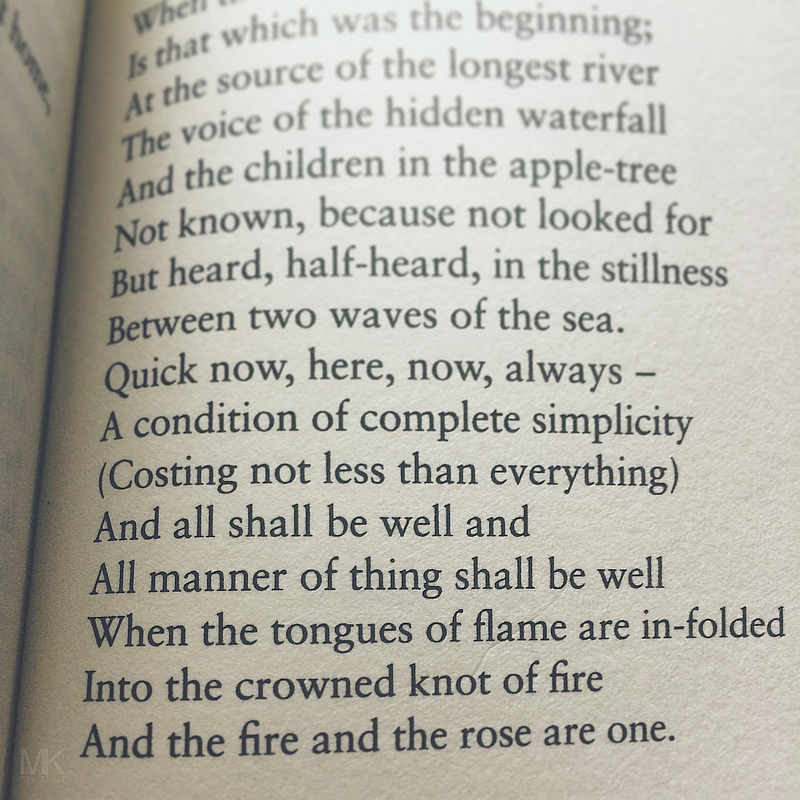 I was reading T. S. Eliot’s Four Quartets today when this section from “East Coker” hit me right in the heart like a jolt from a defibrillator. 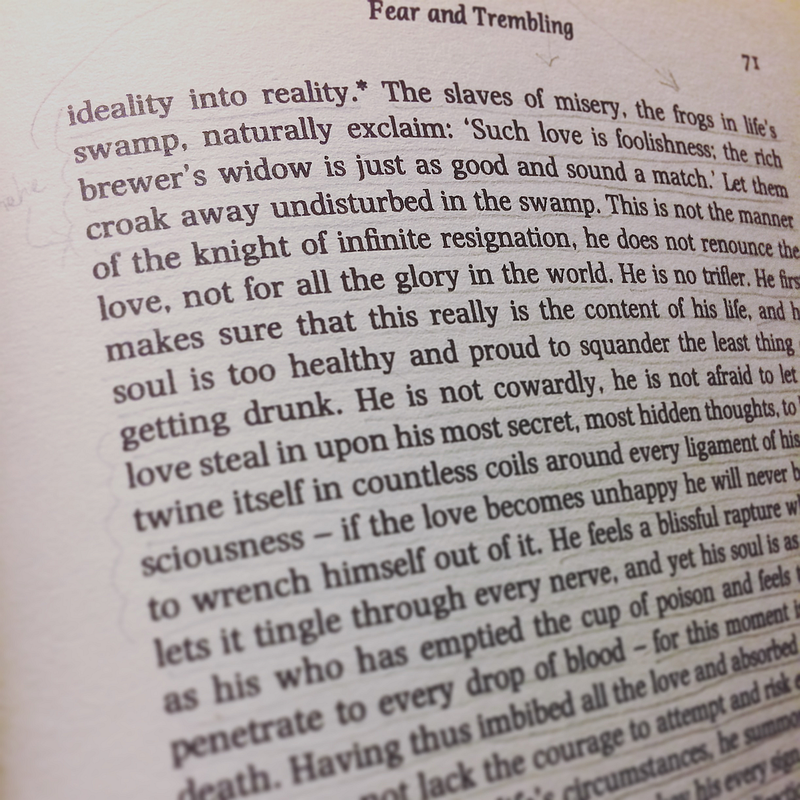 On it’s own, it’s an amazing and brilliant passage. But, in addition to that, it pretty much sums up everything I’m going through and everything I need to hear right now. I can remember thinking, when I read it the first time, that this was a brilliant and deep passage, but it didn’t quite jump out at me. I guess I didn’t need it as much then. This time, reading it was like being resuscitated. Everything about it is perfect for me, at this very moment. It’s as if it were written just for me. When one of your favourite authors (and a thinker you admire) quotes one of your favourite poets (who is another thinker you greatly admire) and says that this line–which embodies a form of hope–is something he has found to still be true, even in his darkest hour, you know that quote has got to be gold. I’ve been oscillating a lot, this month, between grief and grace, peace and pain, determination and the depths of despair. 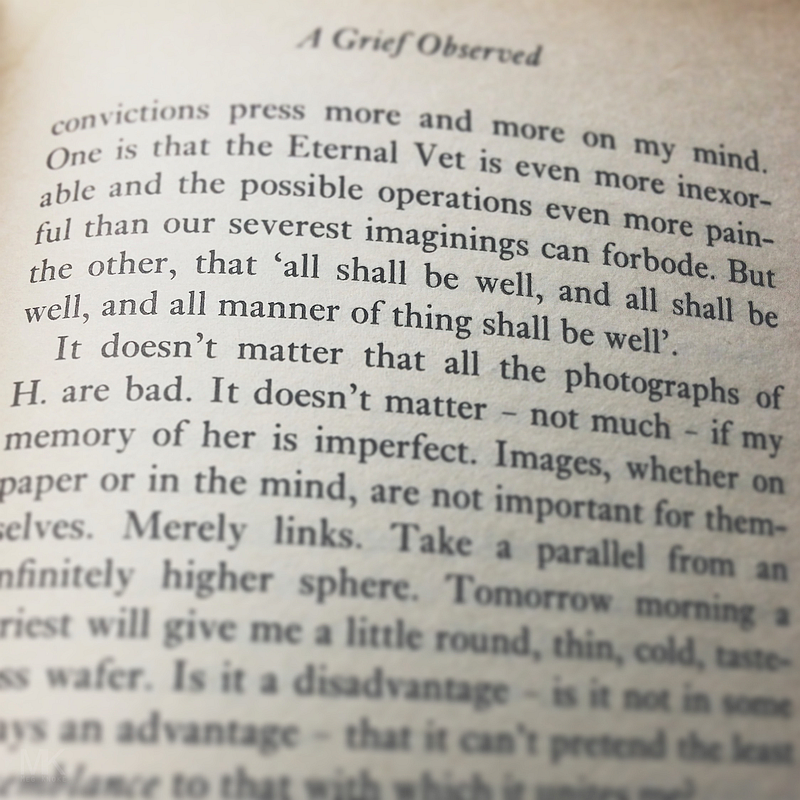 I was feeling especially sad and miserable, last night, when this line suddenly popped into my head, along with a vague recollection of what it represents in both C. S. Lewis’ A Grief Observed and T. S. Eliot’s poem “Little Gidding” in Four Quartets. It’s become my mantra, these last 24 hours, and I’ve been meditating on it a lot. I’ve also reread “Little Gidding” and have started rereading A Grief Observed. They’ve, collectively, been doing their work on me and I’m slowly working my way out of the depths again. This is the only place, I am aware of, that C. S. Lewis ever references T. S. Eliot. The quote, itself, struck me the first time I read A Grief Observed two years ago. 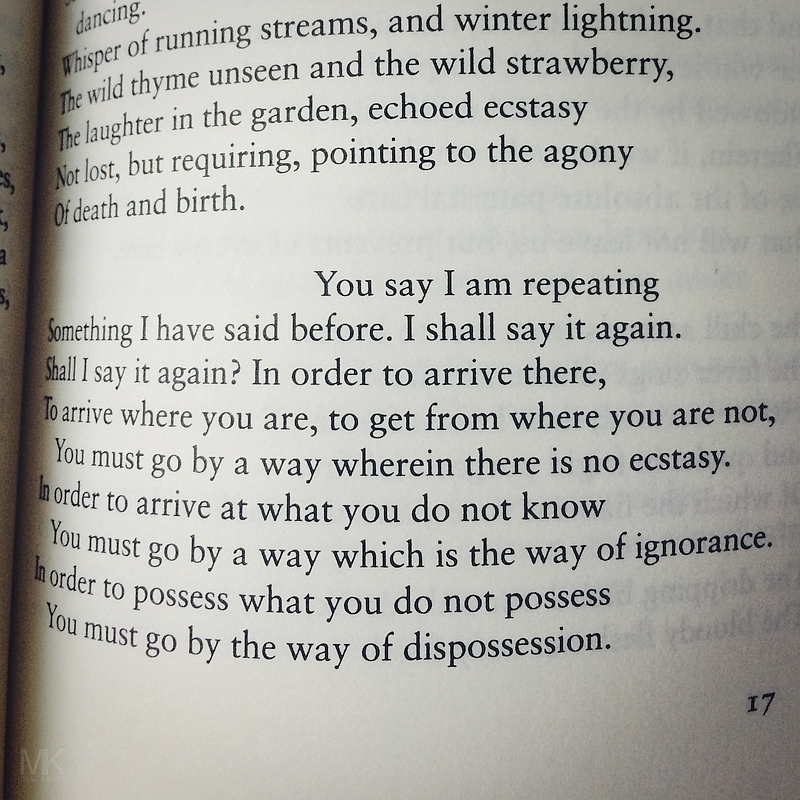 But I was even more struck when I happened to read T. S. Eliot’s Four Quartets, for the first time, a week or two later, and realised that C. S. Lewis had been quoting T. S. Eliot. This line appears, not once, but three times in T. S. Eliot’s “Little Gidding”, twice in the third section and once in the fifth and final section, and is one of the closing lines of the Four Quartets. It turns out, (though not surprisingly, considering the way T. S. Eliot writes his poetry) with this line, T. S. Eliot, himself, is also referencing someone else’s writing. Rereading this above quote, again, today, added another level to my understanding of it’s depth and my meditation on it. (As a side note–if you get it, you get it–I just shook my head and laughed out loud when I realised that the name of the mystic who wrote the original line, was Julian, and that I had only realised it, this afternoon, as I was writing this post. I even didn’t know Julian could be a woman’s name. Sometimes I feel like Providence is having fun at my expense. It’s like this quote is like a little microcosm, hyperlinked down through the ages, that brings with it whole mountains of meaning and worlds of faith, hope and grace. Again, it’s one of those things of which I feel like I’ve only begun to scratch the surface of, when it comes to it’s depth and significance. Here’s a look at what I’ve read, so far, in 2017. I’m having a bit of a dilemma regarding Nikolai Gogol’s works; I’m not exactly sure how to count or list them, as his tales are collected/listed differently depending on the publisher. I think I’ll just wait until I’ve finished reading the other two St. Petersburg Tales and then count all of them as one book. In that case, so far, I’ve finished reading ten books this year (1/3 of the way through my reading goal for the year, yay! 🙂 ). All of them were great reads, though I’ve only managed to blog about one. Hopefully, I’ll eventually get around to blogging about a few more of them. These are the books I’m currently reading. I’ve been slowly making my way through George Mikes’ How to be Decadent and Martin Buber’s I and Thou for about a year now. I actually started reading Buber’s I and Thou last May, but it was a tough read and hard to follow. I only got about 20 pages in before I put it down. I figured maybe it was problem with Ronald Smith’s translation and decided to wait till I could get my hands on a Walter Kaufmann translation instead. 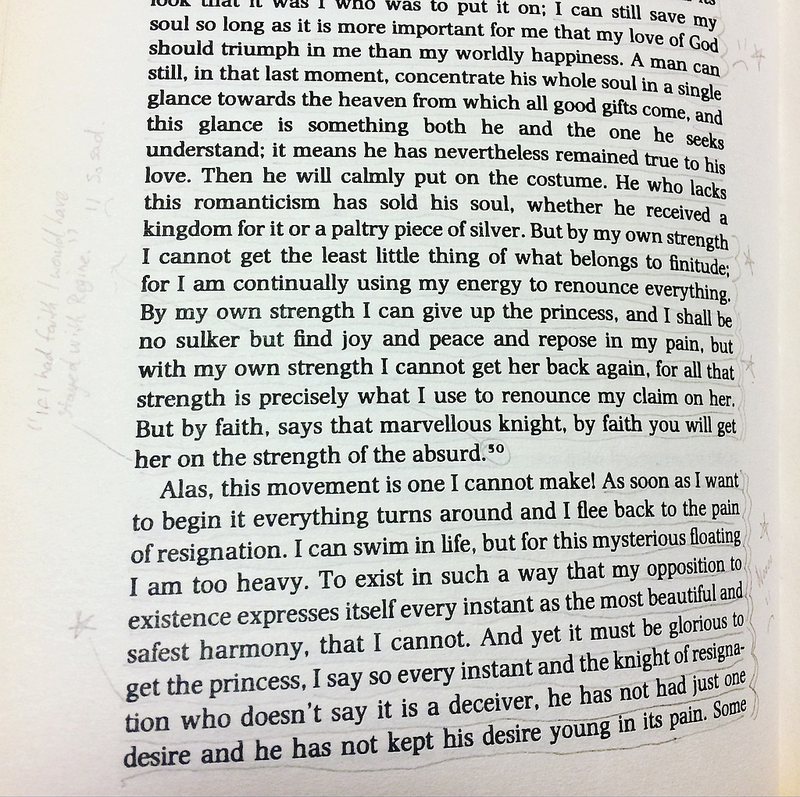 But, recently, I came across a few paragraphs from I and Thou that I really liked that turned out to be a section from the Ronald Smith translation just a few pages down from where I left off. So I figured maybe I’d just stopped before the good stuff, and decided to have another go at it. I’ll still likely still buy the Kaufmann translation, eventually, but I’m gonna give Ronald Smith another go and we’ll see how that turns out. N. T. Wright’s The Resurrection of the Son of God is a tome I’ve been meaning to read for nearly a decade now. I finally bought a copy as a sort of Christmas present to myself last year and figured I’d make it my Lent reading project this year. 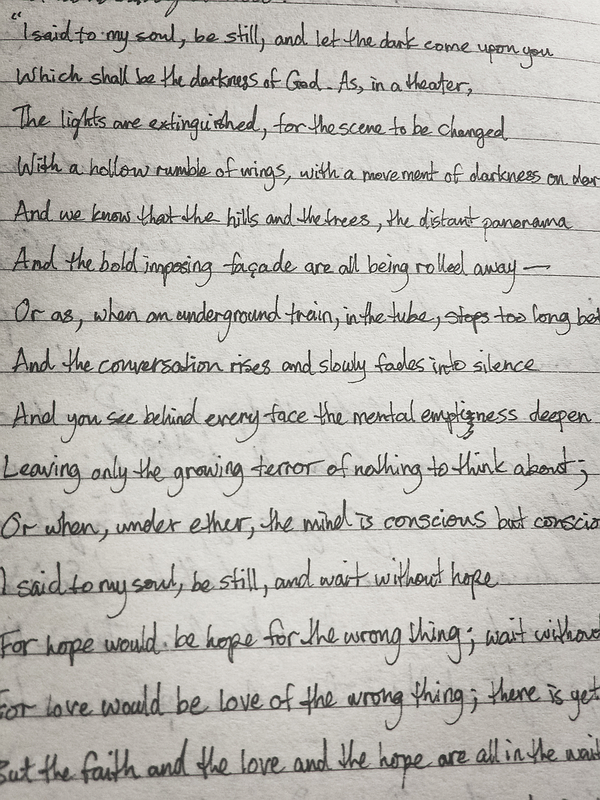 Unfortunately, that plan got hijacked, by my Notes from Underground reading project. Still, I’ve been slowly chugging along at it. I’m only 50 pages in, so there’s no way I’m gonna finish it by Easter, but I’m determined to slowly make my way through it this year. I haven’t started reading Dostoevsky’s The Gambler or the last two of Gogol’s Petersburg Tales, but they’re up next, after I’m finished with Notes from Underground. 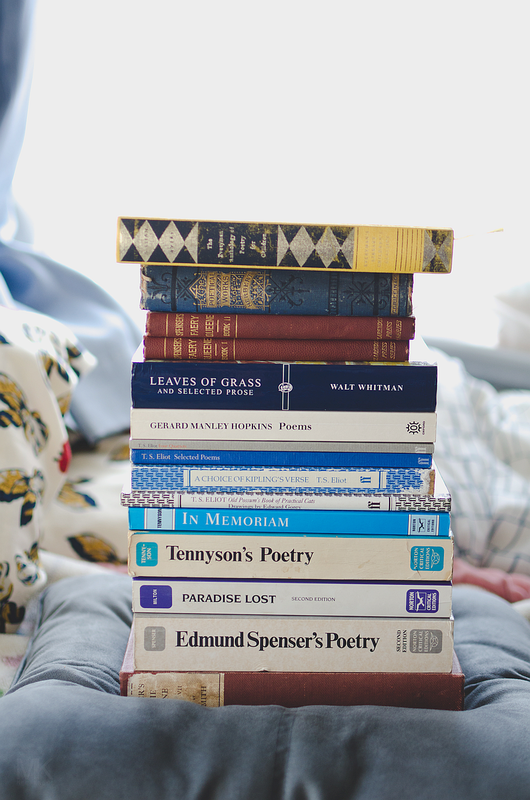 Aside from those books, in celebration of National Poetry Month, I’m hoping to dig into some of the poetry of my two favourite poets T. S. Eliot and Gerard Manley Hopkins. 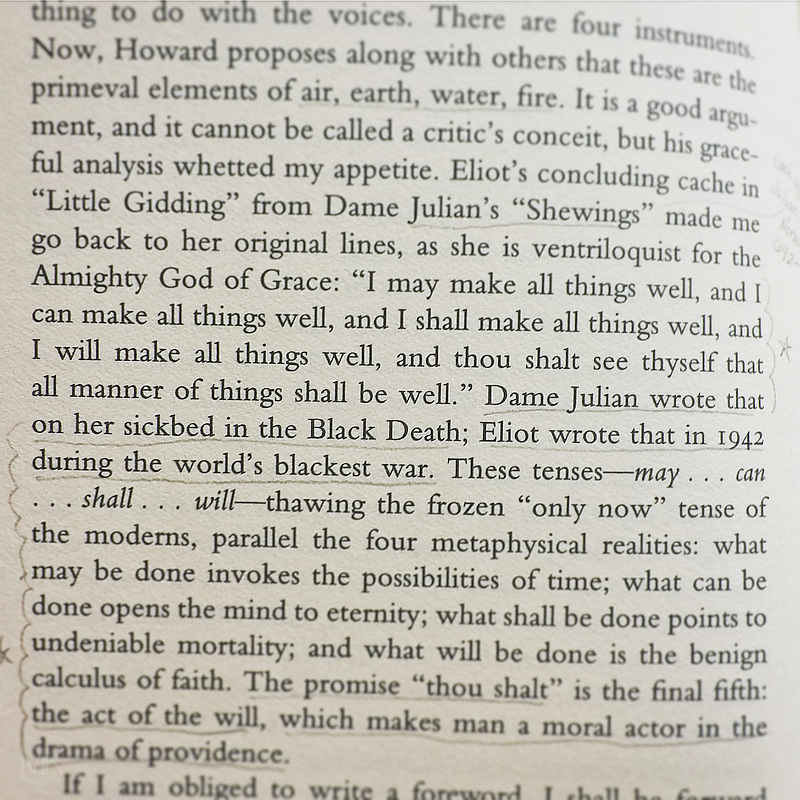 I especially want to focus on T. S. Eliot’s Four Quartets, and possibly “Ash Wedsnesday”. But definitely Four Quartets, which I think is the best of T. S. Eliot’s best. I’ve been wanting to really dig into to it ever since I read it for the first time in November, 2015. I never thought I’d come across a poet I liked as much as T. S. Eliot, but I have. His name is Gerard Manley Hopkins and the more I read him, the more I’m struck by his brilliance. I’ve been meaning to blog about him for two years now, so I suppose this Easter is a good place to start. This isn’t, by far, my favorite Hopkins poem, but it’s probably my favorite Easter poem. I think it perfectly sums up the joy, hope, happiness and celebration of Easter. Hopkins is especially good at evoking emotions, be they jubilant or despondent. In this case, you can feel the jubilation in every stanza and the imagery is splendid. Know ye, this is Easter Day. Know ye not ’tis Easter morn? Decks herself for Easter Day. Let in joy this Easter Day. Make each morn an Easter Day.